Sometimes, getting better means moving on. Maj. Robert Kilmartin spent 20 years in the Army and earned countless medals and awards for his service and heroism, but that was a whole lifetime ago. He’s built a fulfilling post-military life, one without wistful feelings or regrets, and the catalyst for change was golf. The former 82nd Airborne Division member medically retired in 2015, after enduring two improvised explosive device and small arms fire attacks in Afghanistan, which led to injuries in his knees, back, hips, shoulder, and head. He received a Purple Heart for both instances. Kilmartin knew his afflictions had slowed his life down, as he had fewer ways to channel his energy and focus. He needed a purpose. So he turned to golf. Though he still has his limitations, he makes full swings, works out six days a week, and feels much healthier than he ever did before his introduction to golf. Today, he lives in Tampa with his family and attends law school at Stetson University. He’s made a successful transition to veteran life, which he credits the SMGA for, and now he does all he can to help others navigate the jump the same way. 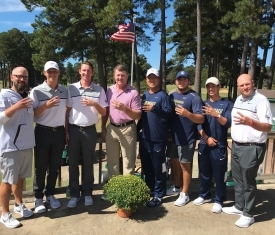 Kilmartin estimates he has introduced at least two dozen wounded veterans to the SMGA’s Warrior Golf Clinics and American Golfer Program, all of whom have been affected positively by their experiences in the organization. Every player now has a purpose, and a few might even be better than Kilmartin on the course. But how does golf, the world’s slowest sport, help vets, who operated at break-neck speeds before their injuries, feel normalized? It seems like the wrong hobby for soldiers who relied on split-second decisions, intuition, and adrenaline on the battlefield; however, those instincts came from countless sessions of rigorous training. In reality, the minutiae of military life is procedure-oriented, a detail that translates perfectly into learning the game. 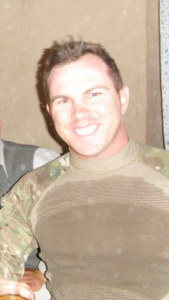 He knows the anxiety well, as he suffered traumatic brain injuries from both IED attacks. He also struggled with anger on the golf course as he learned the game. Eventually he found a way to calm his mind, but it took a change in perspective rather than a mastery of the sport. The SMGA paid for Kilmartin and a few other members to attend Tiger Jam in 2015, an event in support of the Tiger Woods Foundation. While in Las Vegas, Kilmartin had the opportunity to pick Woods’ brain, at a time when Woods was struggling with many of the same injury limitations Kilmartin had. During their conversation, they talked about how to handle failure, laugh at missed shots, and most importantly, accept personal limitations. With challenges like combat injuries, law school, and as he admitted, not knowing “what I want to be when I grow up,” Kilmartin uses that guidance every day and finds it relevant to anything he does. 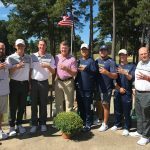 The GW team took on their own set of challenges at the Camden Intercollegiate last weekend in honor of Kilmartin. Coach Chuck Scheinost chose junior Logan Lowe to carry the Warrior Tribute bag at the event. After top-10 finishes in his last two tournaments, it was obvious Lowe had a lot of momentum heading into the event, and he did not disappoint. Lowe managed to close the door on the rest of the field, shooting rounds of 68-70-68 to win by a single shot. Lowe put his stamp on the Warrior Tribute project, adding a trophy to honor the sacrifices of every SMGA member. What better way to salute our heroes than by winning?